Creating a new school is like writing on a blank document. It’s an opportunity to build the organization of our dreams. However, this is not done by a single person. Rather, building an effective school is done by a group of visionaries coming together, asking each other challenging questions, and ultimately charting the course forward together. As the founding principal, Steve Williams has created four priority topics to guide the conversation about what kind of school we will become. These topics aren’t designed to be “top down” directives, but rather a starting point to challenge ourselves with questions that illuminate our collective dream. The topics below are the core of the conversation, but they aren’t the end. Surrounding each topic are other ideas that connect with the vision, concepts that should be considered as we dream forward. Safety Pursued – Safety is the number one priority of any school leader. 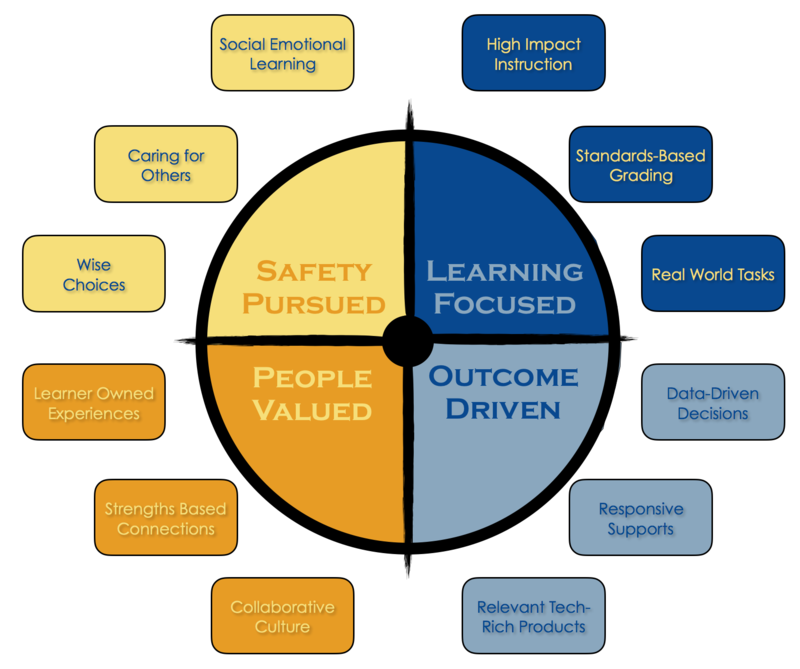 What does the concept of safety and pursing the best for our students, staff, and community members mean to you? Learning Focused – Students come to school to learn, period. How do we focus our efforts to make sure that every student has the opportunity to learn at the highest level in every environment every day? People Valued – Education is a people-oriented endeavor. Students, staff, and community members all come together as unique individuals to engage in the learning process. How do we value each individual as unique and build a system that helps each person engage the process from where they are? How do we create an organization that is open to each person owning their part of the process? Outcome Driven – Ultimately, students leave the school. Before they do that, they leave each grade. Before they do that, they leave each quarter, each unit, each day, each lesson. In order to plan with the end in mind, how do we focus on the intentional outcomes of each lesson, day, unit, quarter, grade, and ultimately our school? How do we ensure that the outcomes of our efforts are what we desire them to be?